We looked at the top 1 Scanners and dug through the reviews from 2 of the most popular review sites including PC Magazine, Tech Gear Lab and more. Through this analysis, we've determined the best Scanner you should buy. In our analysis of 41 expert reviews, the Brother Brother Mobile Color Page Scanner placed 10th when we looked at the top 10 products in the category. For the full ranking, see below. Checkout The Best Scanner for a detailed review of all the top scanners. Throw the lower price into the mix, and the DS-620 can easily be the more attractive choice between the two. However, for low volume scanning the Brother DS-620 Mobile is a simple, cheap, and effective way to get the job done. Unfortunately, the DS-620 did not do well with business cards. The one big caveat: the optical character recognition is near useless, so if you need to search through documents by keyword this isn't the model for you. The Brother DS-620 Mobile Scanner is perfect for the mobile professional who needs a powerful scanner that will slide right into a briefcase or travel bag. Delivering speeds of up to 8 pages per minute(1), this mobile scanner is perfect for capturing digital images of business documents, receipts, business cards, identification cards, photos, invoices, and more. The DS-620 can scan at resolutions up to 1200 × 1200 dpi interpolated and 600 × 600 dpi optical, in color or black and white. Measuring less than a foot in length and weighing less than one pound, this portable scanner is easy to operate and powered by USB. Its inclusion of a valuable suite of scanning software make it an exceptional fit for homes and small businesses or for anyone requiring an on-the-road scanner. The Brother mobile scanner includes multiple software solutions, including desktop document management, business card management, and OCR management. These help you stay organized once you’ve captured your digital image. The DS-620 is also compatible with BR-Receipts(2), a receipt management software solution for organizing scanned receipts and data by exporting them to the QuickBooks and Quicken programs. This portable digital scanner is compatible with Linux, Windows, and Mac and comes with a one-year limited warranty and free phone support for the lifetime of the product. (1)Color and monochrome scan speed with all advanced features turned off, LTR at 300dpi. See manufacturer’s website for details. (2)Additional purchase required. BR-Receipts software available via download from Brother Online (only available in the USA). Visit manufacturer’s website for download details. Quicken and QuickBooks are trademarks and service marks of Intuit Inc., registered in the United States and other countries. Today, the world seems to get by with far less paper, thanks to technology. Still, there are many instances where a piece of paper is the only option. When you need to turn a document or photo into an electronic file, scanners are the way to go. Even if you find you rely on it less than ever, you’ll at least occasionally need one, whether it’s at work or at home. Digitizing paper documents isn’t the only reason to have a scanner on hand. If you have printed pictures, you can scan and save them to preserve them indefinitely. You may even be able to touch up that decades-old photo of your grandmother and make up for some of the fading that happened while it was “safely preserved” in a photo album. At the very least, you’ll be able to scan and save them to a cloud-based storage service, where they can be accessible to you and your loved ones indefinitely. Shopping for a scanner can be overwhelming, though. Most of the scanners on the market today are not only efficient and affordable, but they provide high-quality scans. Some are better than others in those areas, though, so it can help to know what your own needs are likely to be before you buy. If you foresee regularly needing to digitize stacks of documents, a scanner with a good feeder should be high on your list. If you have boxes of photos you need to save and send to the cloud, high-quality photo scanning is a must. Unless you’ll have a tech guru on hand to set up and troubleshoot issues with your scanner, you’ll also want one that’s easy to install and use. Some scanners do a better job of getting you online and connecting your devices. Others require extra work to get online and add additional computers. Make sure you know what you’re getting into when you pull your new scanner out of the box. At one time, you would have expected any office to have at least one file cabinet. But many businesses have done away with paper-based filing, instead choosing to have employees store their documents in a secure network location. But despite this move toward digital, businesses still consume a surprising amount of paper each day. In fact, paper output is supposed to increase by half a percent through 2021. Why is there so much paper? Experts say 45 percent of the paper printed in offices ends up in the trash. This means people are printing documents for temporary use, then tossing them, often not even recycling them. Even with all of the document management solutions today, employees still seem attached to having a piece of paper, at least for some of their daily tasks. Your first experience with your new scanner will be during setup. The Fujitsu ScanSnap iX500, Epson Perfection V550 Scanner and Epson Workforce ES-500W provide easy installation processes, walking you through the steps to connect them to your Wi-Fi network. Once you’re online, you’ll also need to be able to connect to the devices in your home or office. The Fujitsu ScanSnap iX500 is compatible with Windows, Mac, Android and iOS, covering the most popular devices. The Canon CanoScan LiDE220, on the other hand, can only be guaranteed to work with devices using Windows 8.1 or earlier or Mac OS. The Epson Workforce ES-500W requires you to install Epson ScanSmart software and is only compatible with Windows 7 through 10 and Mac OS 10.11x to 10.13x. You don’t have to save your documents to a device in order to scan, though. Some scanners will let you send items directly to the cloud. With the Canon CanoScan LiDE220, you can scan documents using “Send to Cloud” if you have Evernote or Dropbox installed. The Epson Workforce ES-500W also lets you easily scan documents to your online storage accounts. One issue with the Fujitsu ScanSnap iX500 is that you can only connect wirelessly to one device at a time. If you need to edit your documents after scanning them, you’ll probably want good software for that purpose. The Canon CanoScan LiDE220 and Epson Perfection V550 Scanner both come with basic editing software that lets you make basic photo tweaks. If photos are your priority, stick with the Canon CanoScan LiDE220, which has a scanning resolution of 4800 x 4800. You’ll get high-quality images from that. However, if you need to scan film or access 3D-scanning capabilities, you’ll need to choose from scanners that offer that functionality. The Fujitsu ScanSnap iX500 is designed for scanning paper documents, such as letters and memos. It’s not as good for tackling a wide range of document types with ease. Chances are you don’t have hours to waste on setting up and troubleshooting your scanner. The Fujitsu ScanSnap iX500 and Canon CanoScan LiDE220 are both easy to use with a minimal learning curve for each. Nothing comes in as handy as a document feeder when you’re dealing with a stack of paperwork. The Fujitsu ScanSnap iX500 and Epson Workforce ES-500W have document feeders that can hold up to 50 sheets of paper at a time. You’ve probably experienced scanners that take a while to process each document. If you’re scanning multiple pages through a feeder, this can be especially important. The Fujitsu ScanSnap iX500 is rated at 25 pages per minute, which is faster than many competitors. 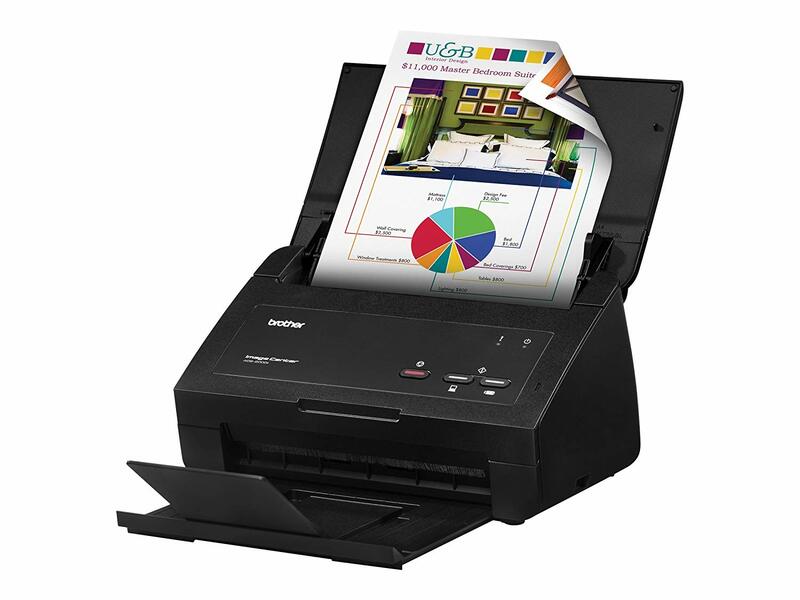 The Epson Workforce ES-500W is rated for 35 pages per minute and does seem to scan quickly for its class. It also features ReadyScan LED technology that cuts out that warm-up time that slows down your work. The good news is, scanners are more affordable than ever. You can get a great scanner like the Epson Perfection V550 Scanner for less than $200. The Epson Workforce ES-500W retails for between $300 and $400. It’s also important to consider size when you’re choosing a scanner. The Epson Perfection V550 Scanner measures 19.1 x 11.2 x 4.6 inches, which means you’ll need to clear away significant space for it. The Fujitsu ScanSnap iX500 is only 11.5 x 6.6 x 6.3 in, while the Canon CanoScan LiDE220 is 9.9 x 14.4 x 1.6 in. The Epson Workforce ES-500W is only 11.6 x 6.9 x 6.6 in. If you use document management software, the Epson Workforce ES-500W has a built-in TWAIN driver that connects up to most popular document management platforms.